Electricity. It's the most fundamental, basic yet simple thing in the 21 st century that power our life.Without it, there is no working phone, internet, tv , radio, washing machine and etc. However some folk in the world still does not possess access to electricity . Solution . Kick da ball. 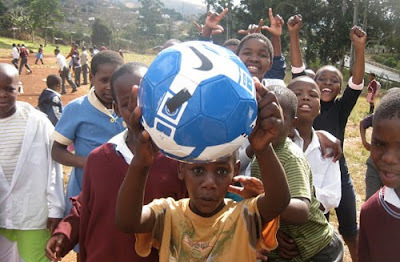 No I not talking the upcoming World Cup at South Africa , but unique project called sOccket , a soccer ball that turn energy from kick into electricity.No kidding. So it kinda 3 in one thingy or 4 if u count kicking the ball around, a portable generator,community builder and global health tool.